The chimney or flue in your house will normally determine what type of fire you will choose. 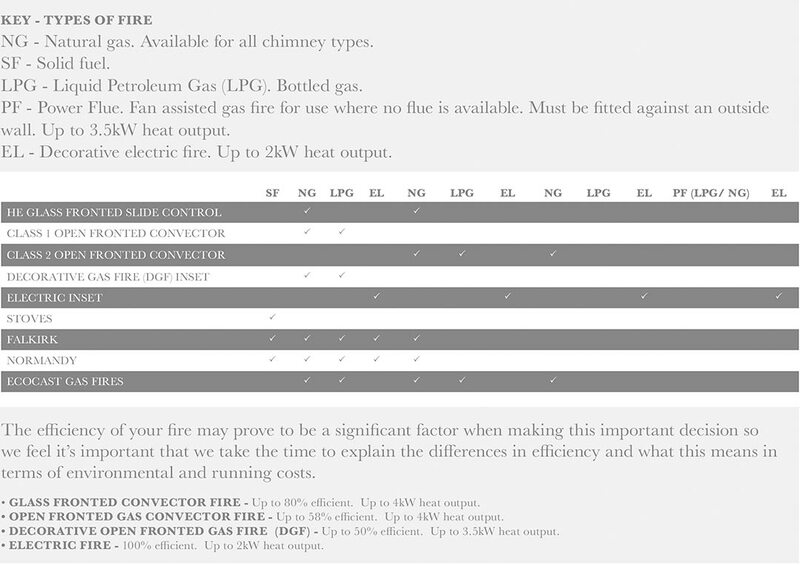 STEP 1 – Identify which type of chimney you have or whether you have no chimney using the information below. STEP 2 – Now you know what type of chimney you have (or if you have no chimney) you can decide on the type of fire and preferred source of fuel. Ensure that the fire can be matched with a suitable suite combination. Many of the fireplace suites in THE GALLERY COLLECTION are available in several different material options, giving you the opportunity to choose the perfect style to suit your tastes and requirements. 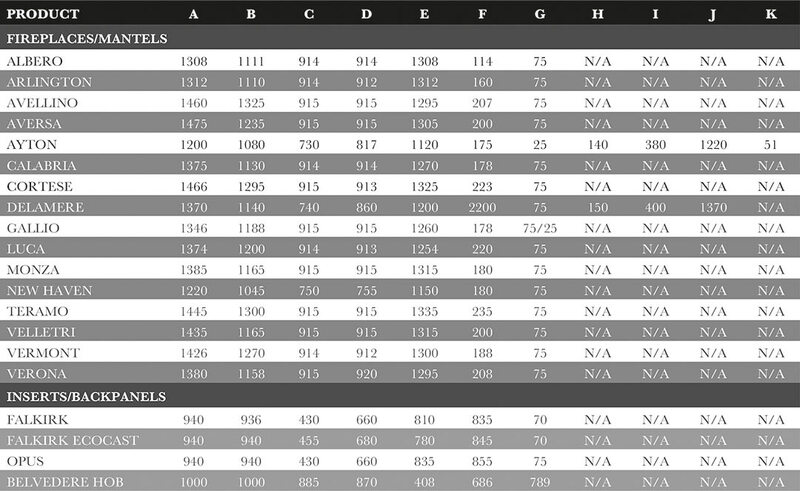 For more information on material options and product dimensions, see below. 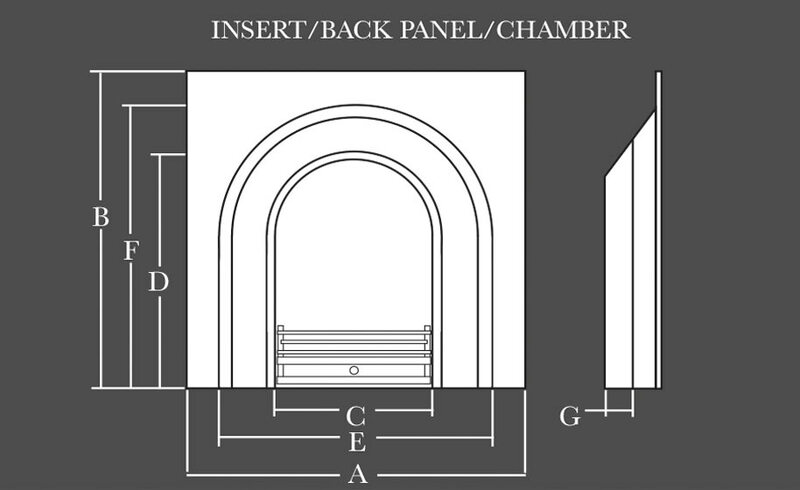 Every fireplace suite comes complete with a surround, hearth and back panel, all cut from the same batch of material so as to ensure a good tonal match. There are many factors that will determine which is the ideal stove for you. Luckily, we have a variety of stove types to ensure there is an option to suit your particular needs. MULTI-FUEL If a stove is specified as multi fuel then it can burn a number of different fuel types including wood, coal, coke, peat, anthracite and smokeless fuels. CLEAN BURN Some towns and cities of the UK are designated SMOKE CONTROL areas and prohibit the burning of smoke producing fuels such as wood. In such circumstances, stoves can still be used if they burn smokeless fuels or gas. However, if you live in a smoke controlled area and still want the freedom to burn wood you can use a DEFRA approved CLEAN BURN stove. These stoves are specially designed to burn wood whilst producing lower smoke emissions. For information on smoke controlled areas visit the DEFRA website www.smokecontrol.defra.gov.uk. 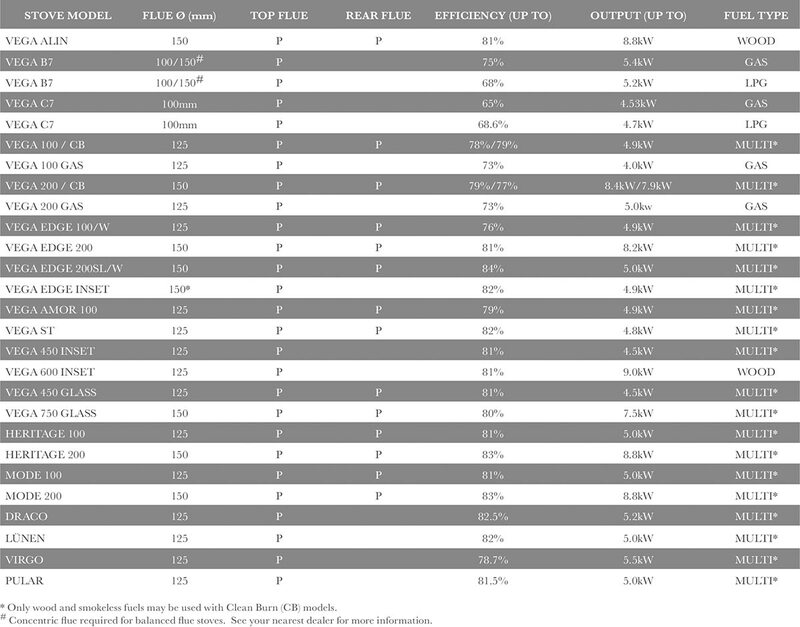 To help you decide we’ve put together a table below so you can compare the features and specifications of each stove in The Penman Collection. Don’t forget, your retailer is on hand with helpful advice to assist you with your decision. All the cast iron products are delivered with a protective, oil-based coating on polished surfaces. This should be cleaned off during installation. It is recommended that a spray-type oil is applied from time to time in order to avoid surface rust appearing. Ensure that the room in which the cast iron product is being installed is thoroughly dry. For example, recently plastered walls cause high levels of moisture in the atmosphere and, as a result, rust is likely to occur. Under no circumstances should a water-based cleaner or polish be used to clean cast iron products. When using ceramic fuel beds, ensure that these do not touch any of the polished surfaces as this will help to minimise the possibility of thermal discolouration. High temperature paint is used on the black and graphite products where fires will burn. This paint will eventually burn off. A proprietary, high temperature paint can be used to re-coat your fireplace. Such paint is available from your retailer. Its your responsibility to burn smoke free fuels if you live in a smoke free zone. There are some very high temperature burning fuels which can cause damage to any fireplace. Please refer to the Solid Fuel Association (www.solidfuel.co.uk) recommendations and use an approved coal merchant as your supplier. No responsibility can be accepted if high temperature fuels have been used or if there is excessive draft. If in doubt we recommend the use of a clay fire back. Clean ash away regularly as a build up beneath the fire will cause the grate to burn out quickly. The grate is a consumable part of your fire and will need replacement from time to time, depending on the frequency and burning temperature of your fires. Protect the surface from strong coloured solutions and citrus juices as the acid may etch the surface. To maintain the subtle shine of the surface, occasionally wipe over with a solution of general household cleaner and buff with a soft dry cloth. Do not use any bleach or abrasive cleaning agents as these will scuff or dull the shine. Extensive tests prove textured marble to be virtually stain and scratch resistant. If minor scratches occur then please use the small touch up kit supplied. If spillages occur then use a soft, damp lint-free cloth immediately to wipe away the spillage. This material offers the benefits of being lightweight, sturdy and durable, however it is not resistant to very hot items which could result in discolouration. For this reason we recommend that it is not used in conjunction with any solid fuel fires. To clean, dust occasionally with a soft dry cloth. Avoid silicon based sprays. GAS FIRES A gas fire is a technical piece of equipment and, just like a gas boiler needs regular servicing. Please ensure that you have your gas fire serviced regularly by a GAS SAFE REGISTER (Board Gais in ROI) registered installer. This will help you enjoy safe and trouble free enjoyment of your fireplace for years to come and may be a requirement of the Government’s Home Information Pack. All the gas fires we supply are tested in accordance with CE requirements and are CE marked. Due to the manufacturing processes all measurements are approximate and may vary slightly so allow for a tolerance of plus or minus 12mm. In order to achieve some of the colour options, we plate the products using a variety of manufacturing processes. When we state that a product is “Antique Brass finish” or “Chrome finish” there is no intention to mislead. The products are not brass or chrome respectively, they are simply plated to give that effect. MICROMARBLE & TEXTURED MARBLE products are not suitable for solid fuel applications. The colours shown in the photography and brochure is as accurate as possible, but if the colour you require is critical then please consult your retailer before basing all your decisions on the colours shown here. Your home may have a chimney type which will allow you to choose any of the fireplaces shown in the brochures. However, please consult the selection charts in the brochures and if you are not clear please consult your HETAS or GAS SAFE REGISTER (Board Gais in ROI) registered installer or your retailer. Gas fires with a gas input of 6.9kW or less do not normally require air vents, there are some circumstances where vents may be required. This is determined by your installer carrying out a spillage test during the commissioning process. If your chosen fire has a gas input greater than 6.9kW then a vent will be required. Please ask your retailer for further information. There are occasions when designs, or products are altered or discontinued without prior notice (a reserved right), so if you are about to set your heart on a particular fireplace, please consult your retailer before making that final commitment. ADVICE BEFORE YOU COMMIT TO THE INSTALLATION OF YOUR PENMAN COLLECTION FIREPLACE. It is a major project to have a new fireplace installed and it is good practice to try and prepare yourself as well as possible. All installations must be carried out in accordance with the requirements set out in the Building Regulation documents, in particular, Approved Document J. There are independent bodies which have been approved to carry out installations in accordance with these regulations. For gas installations the most recognised independent body is GAS SAFE REGISTER (Board Gais in ROI) and for solid fuel installations it is HETAS. Please confirm with your retailer that your new fireplace will be installed appropriately. If you have your new fireplace fitted by a GAS SAFE REGISTER (Board Gais in ROI) or HETAS registered fitter you will be given a certificate stating that your installation has been carried out in accordance with the Building Regulations. If you do not have one of these certificates then you will have to arrange for your local Building Control Officer to inspect your installation and approve it. 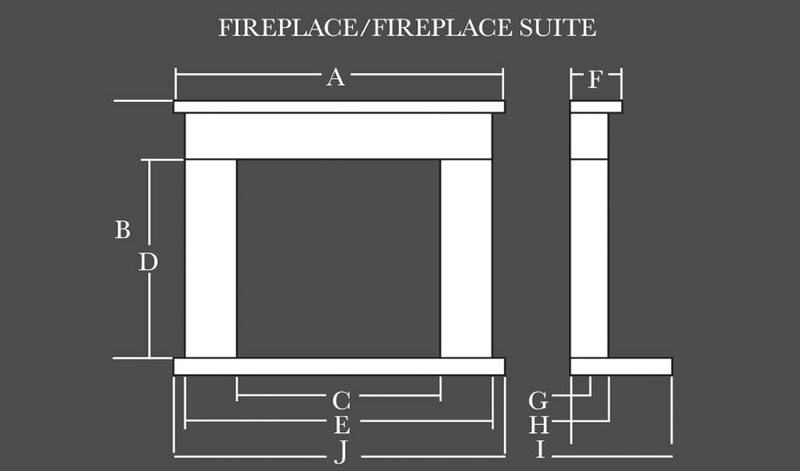 Your fireplace is made up of a number of different components and it is important to ensure that your installer not only meets the requirements above, but that he also has the necessary experience to fit ALL those components, for example a Portuguese limestone suite with a fire frame and a powerflue fire. In the unlikely event that there is a defect in any of the products shown in this brochure, then a replacement will be supplied without hesitation. Of course, this requires the products to be fully inspected prior to installation as no responsibility for re-fitting or redecoration can be accepted if defective products have been installed. In this case and in the case of accidental damage after installation, in-situ repairs can be made by specialists, subject to prior agreement of terms with your retailer.